Minimal, cyclical drum beats and an addictive acoustic riff keep emphasis on the freeform lyrics, and both singers play off each other's words as if they were of one mind. 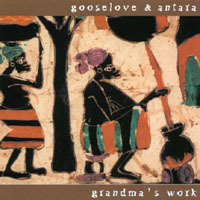 Antara joined forces with folk poet Gooselove to create Grandma's Work. Here's what a reviewer had to say about their collaboration. "Setting the bar high is Gooselove and Antara's "Change With Me, " a funky half-sung, half-spoken duet that shuffles back and forth, cutting under itself like two different currents at two different depths. Minimal, cyclical drum beats and an addictive acoustic riff keep emphasis on the freeform lyrics, and both singers play off each other's words as if they were of one mind." This disc features the artistry of Ember Swift, Lyndell Montgomery, Cheryl Reid and Nebulai. political art doesnt have to be ugly or angry! Representing a clear voice of the people, Grandma's Work shows that being political, aware, and active doesnt have to be an ugly or angry task. While the tone and lyrics dip down into some dark places ('Daddy'&'Time Bomb') other songs such as 'Change With Me' and 'Sittin By Myself' forcus a positive light on the true essence of revolution: the individual. The combination of "rythm poetry" aka rap, and folk guitar and backups make this cd accessible to urbanites and local yocals alike.